Maker: Francis Morley & Co. In the great array of items that today are attracting a constantly growing number of antique collectors nothing seems more popular than old china. The reason is not hard to find: ceramic wares offer something for everyone. The choice ranges from rare early porcelains to the lively naiveté of sponged earthenware for the kitchen. The sturdy integrity of salt-glazed stoneware has its admirers, and even toy tablewares, once the delight of Victorian children, now have adult collectors searching for them. It is their diversity that makes ceramic wares so fascinating to collectors. There are as many reasons for collecting as there are collectors themselves. Canada's national ceramic collection, comprising some 4,000 items, has enough diversity to please every taste. At the same time, it is a sharply focused collection whose clearly defined purpose is to illustrate what was in use in Canada in times past. The collection is the responsibility of the History Division of the Canadian Museum of Civilization. It is an ongoing collection, in terms of acquisitions and supportive research. The evidence for what was used in Canadian homes has been amassed from a wide variety of sources: archival material, reports of archaeological investigations, family histories, published and unpublished reminiscences of pioneers, and countless advertisements in early Canadian newspapers right across the country from Newfoundland to British Columbia. Old bills and shipping orders (rarities in their own right) have added to the body of knowledge. 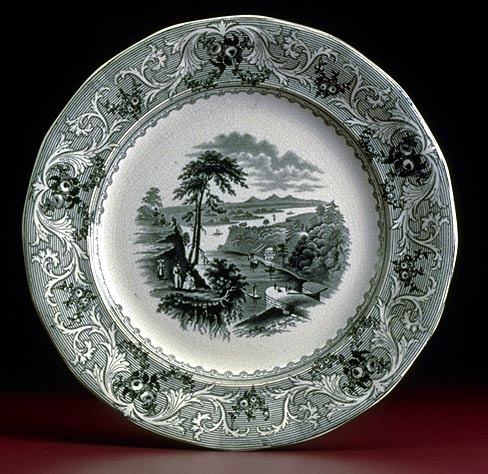 The names of Canadian importers, occasionally found on plates and dishes, have made it possible to document types of wares and particular patterns in use in defined areas at precise periods. Using all this material, the History Division has built up a collection of value to the social historian while simultaneously adding another dimension to china collecting. The collection is richest in nineteenth-century wares — and for sound historical reasons. It was in the nineteenth century that improvements in ceramic techniques and manufacturing processes made both earthenware and porcelain more widely available than ever before; and it was in the nineteenth century that Canada's population began to expand dramatically, increasing demand for such wares wherever a new settlement opened up. A special section in Canada's national collection is devoted to earthenware printed with scenes of Canada taken from published engravings and produced by both English and Scottish potters. An unidentified British potter used Arctic scenes from books of exploration in the Canadian North and incongruously surrounded them with a border of birds, animals and flowers that never knew the North. China collecting can become a passion. It was the nineteenth-century writer Mark Twain who once, in an excess of zeal, admitted he would willingly "desert a drowning relative" if the opportunity to identify a piece of rare porcelain presented itself. But there is far more to old pottery and porcelain. They become important tools for the social historian. They mirror everything from the place of these wares in trade and commerce to the "Japanese mania" that gripped the fashion-conscious in the 1880s. It is on the basis of their value to the social history of Canada that this collection has been formed; but it serves the china collector equally well.